I admit this is a new one on me. Marcel Deiss from Bergheim in Alsace grows and vinifies – together – the different grape varieties from a particular location. In this way, the effect of the varietal characteristics are reduced, and, a truer expression of terroir (the sense of place) is attained in the finished wine. This is not generally the case in Alsace where wine labels prominently feature the grape variety. The bottle contained no indication of the grapes used and their proportions. 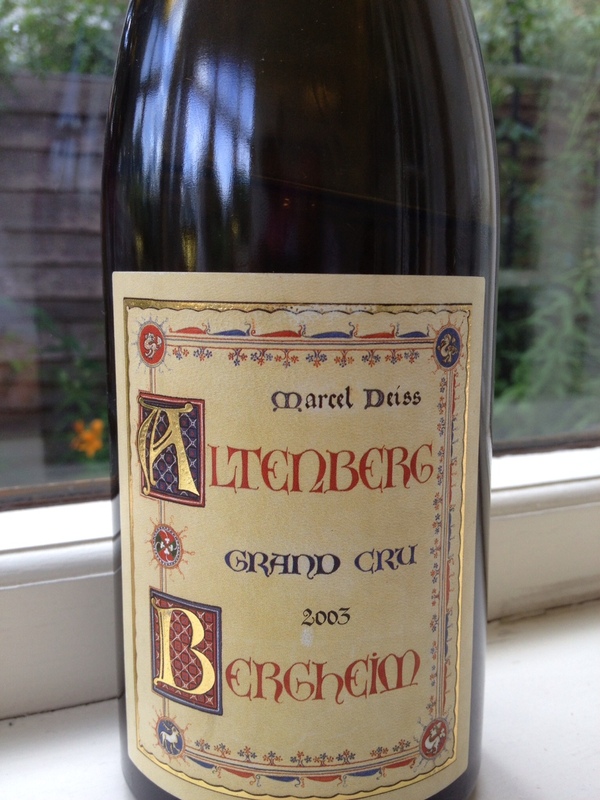 The wine was a Grand Cru Altenberg 2003. It had a very deep gold colour, was beautifully clear and really inviting. With that depth of colour we expected sweetness but the viscosity (legs) wasn’t that pronounced on the side of the glass. It was 12% ABV. Initially the nose was quite peppery but, as to be expected, not strongly varietal so we had a guessing game as to what might be in the blend. We thought we could detect Riesling and, later, Muscat. But their characteristics were muted. Reading between the lines of Deiss’s web-site and field blends, it appears he is certainly regarded as unconventional in Alsace and has had disagreements with the authorities. But that is not unusual in this region where individual growers dominate. We can thank the New World for the focus on varietal characteristics. Mono-varietal wines are so well-established that to taste a blended wine now seems slightly strange, especially one that has seven different grape varieties in it. The list is Macabeo (41%), Chardonnay (18%), Sauvignon (16%), Muller Thurgau (10%), Albarino (10%), Riesling (3%) and Muscatel (2%). All these go into making Tomas Cusine’s Auzells 2010 white wine from the Costers del Segre DO in the north east of Spain. We’ve previously tried a Tomas Cusine Macabeo which was delicious – especially if allowed to breathe and decanted well before drinking. So – grape expectations for his Auzells. Perhaps too many expectations that this did not fulfil. It was an attractive lemon colour, clear and bright in the glass with no green tinge. The nose was slight and I smelt some white pepper to start with, but this vanished as it developed some sweet notes when left to develop. So far so good. The taste was – well, commercial. It showed freshness through its acidity but was rather short and, to be unkind, a little hard on the finish. There was little complexity and not really worth the Wine Society price of around £10. 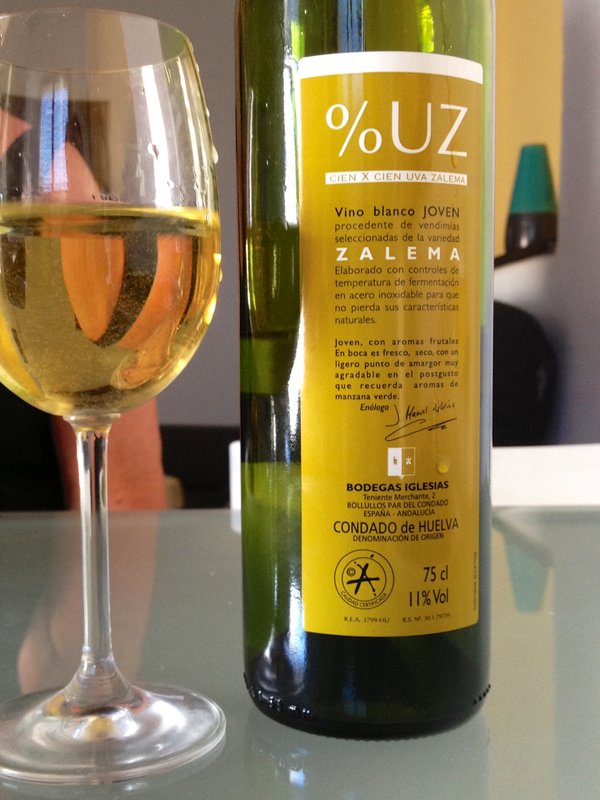 Was it typical of modern Spanish white wines? Yes, and disappointingly so. And I can’t quite understand the difference that 3% of this and 2% of that will really make. The ten cru Beaujolais are heralded as being the best of the region and yet, as previous posts indicate, even their qualities are variable. It seems that the grower is the reliable guide to quality. 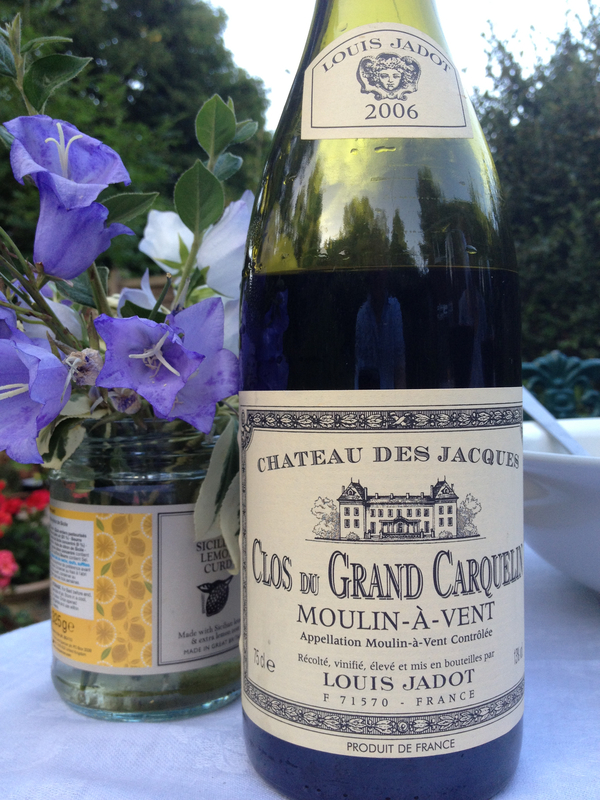 Therefore when Richard offered a bottle of Moulin a Vent 2006 made by Louis Jadot I expected a well-made wine. This was the Clos de Carquelin (£22) but not only was it seven years old but also had been open 24 hours. The colour was a very deep red, not completely clear, viscous and with a slight brick-coloured rim. All to be expected from the gutsiest of the cru. The nose was vegetal and alcohol-laden but not particularly characteristic of the gamay grape. When tasting it you would be forgiven for thinking this was a Pinot Noir from Burgundy, so pronounced were the savoury notes with the slight sweetness of the style. It had none of the Gamay red berry fruit characteristics and, considering it was seven years old, it had a firm structure. There was slight oxidation, not surprisingly, but it was still a lovely mouthful. The observation that the Gamay grape takes on the characteristics of its clone/cousin Pinot Noir was certainly evident in this wine. The fact that it had been opened 24 hours thereby had accelerating the ageing process didn’t detract from our enjoyment. It was a lovely wine, showing its provenance admirably. [Richard: from WS, part of a mixed case of older beaujolais]. 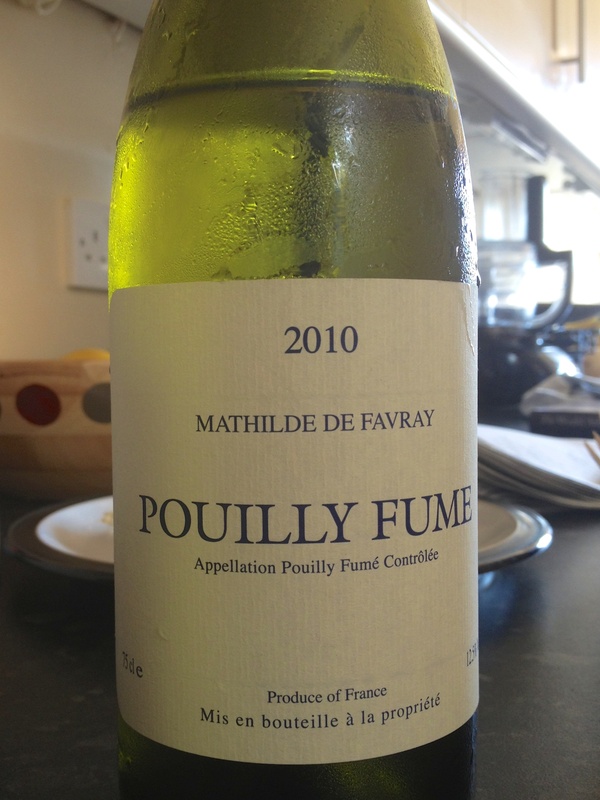 On the 29th December we reviewed a 2006 Mathilde de Favray Pouilly Fume from M & S. The wine was past its best and the post talked about the importance of not leaving some wines too long before enjoying them. Well, these few words are concerning the 2010 vintage of the same wine. it is still sold by M & S at about £12. The appearance was bright and pale green in colour,but almost water-white. This all suggested the acidity was obvious on the nose even though the overall impression was one of a mature wine of its type. It had a fruity, rather than floral, nose which was quite ripe and certainly whistle-clean. Definitely dry, the crisp acidity was fairly intense but a little on the short side in its aftertaste. Overall the impression was one of a well-made wine of good, subtle quality that needed drinking now rather than keeping. I think that the New Zealanders have rather changed the game for the traditional Loire sauvignon producers. This competition, and the fact there has been a lot of poor quality French PFs and Sancerres over the last 10 years which have sold because of the name on the label, has shifted expectations of the varietal. Nowadays, consumers have had their perceptions altered as to what makes a good sauvignon and demand more intensity of bouquet and flavour than previous – but these don’t always make for good food wines. There are also a lot of average NZ sauvignons about. (Interestingly, consumers are more undecided on the merits of NZ Pinot Noirs versus the French counterparts.) Perhaps the French producers are seeing commercial benefits of blending sauvignon with semillon, as in the classic white Bordeaux wines, to shift the focus away from a direct comparison with the NZs. I am visiting the Loire this summer and it is going to be interesting to talk to vignerons about the different styles and the impact from the Antipodes. 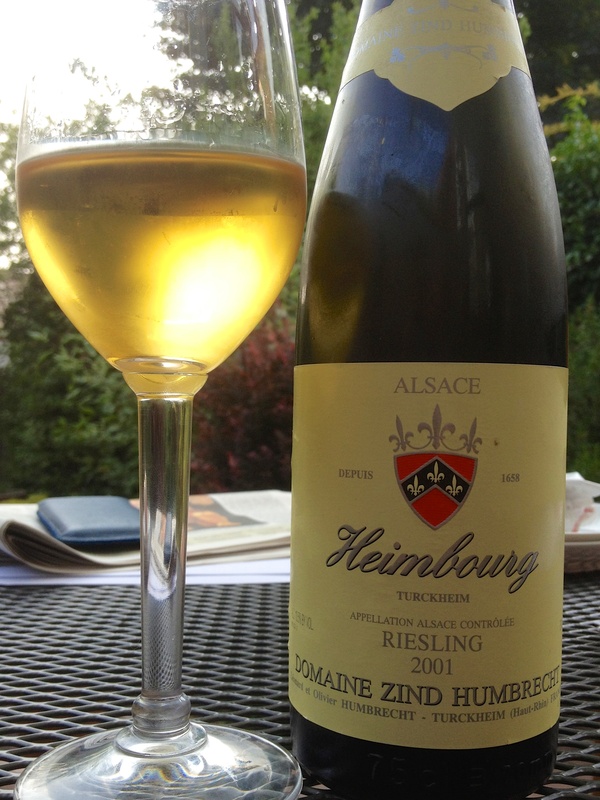 On Friday evening we tasted a twelve years old Alsace wine, a 2001 Heimbourg Domaine Zind Humbrecht Riesling. The cork is marked ‘vin de garde’ – a wine for keeping – but Richard decided that it couldn’t be ‘garde’ any longer. I’m glad he did. The cork closure was capped by wax, as befitted its designation, but, after this was carefully negotiated and the wine poured – what a colour! Clear and intense gold shone from our glasses and we were already getting wafts of fruit before specifically smelling it. There were some legs (13.5% ABV) but not a great deal. The nose was of a clean but mature wine, ripe and fruity with lime and spice smells but not in an overly-assertive way. Surprisingly, there was no strong kerosene so typical of older Rieslings – it was restrained yet powerful. The taste was very slightly off-dry but held in a beautiful balance of acidity and richness, neither dominated the other. The body was weighty and the fruit flavours stayed in the mouth long after the wine had been swallowed. To confirm what we had smelt, the taste was not aggressively Riesling but it was there, as was a structure that maintained the wine’s focus. We both marked the quality of this mature wine as outstanding. It was purchased from Gauntley’s in Nottingham at around £30. Once in a while, it really is worth it. Two things going for this half of manzanilla. Fabulous label and the cost, namely 2€. As you might expect at the price, not very complex or even typical but a good light aperitif. From the no-name bar/sherry shop on Calle Arcos, full of old boys drinking house oloroso at 0.70€ a glass. 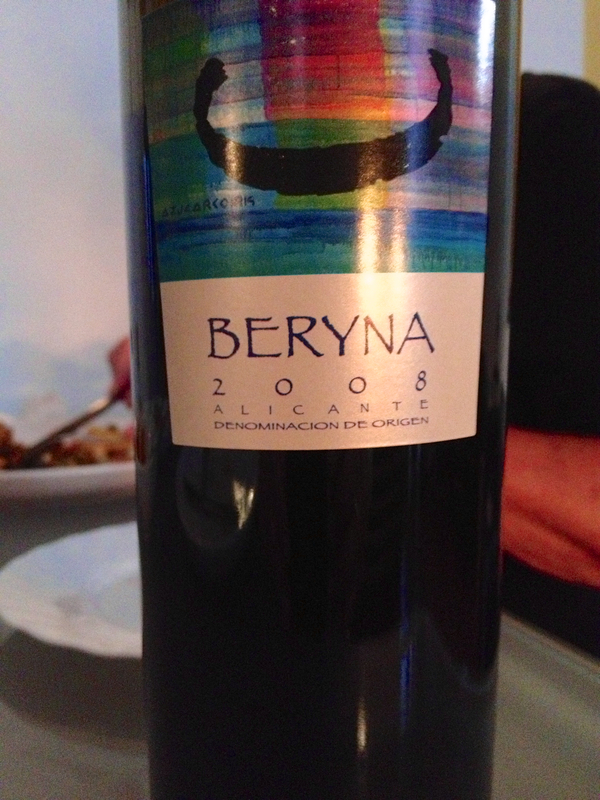 This was very good, mainly Monastrell, big, warm, spicy with a great mouth feel. From Alicante. About 14€. This is that very rare thing, a red wine from Jerez. The vineyard is east of the airport. Young, fresh, very drinkable, about 6€. 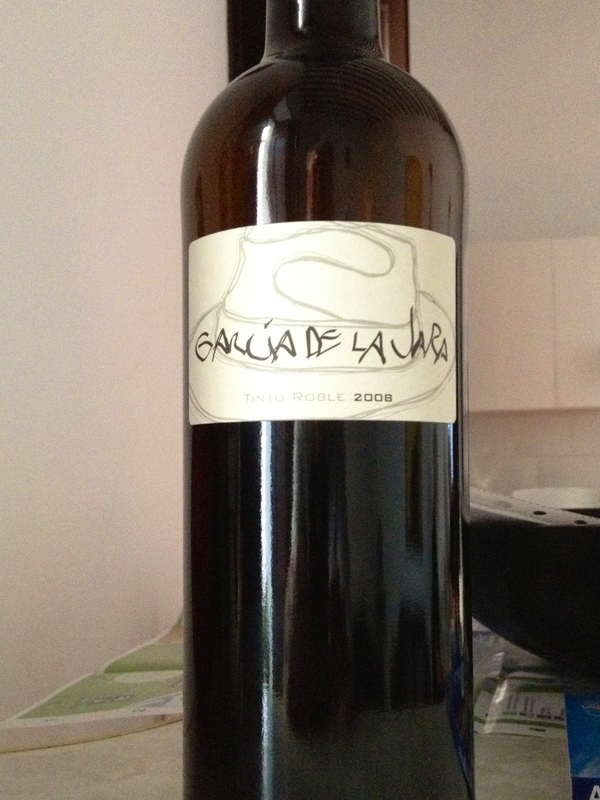 Another local wine, grown in Sanlucar de Barrameda, by the sea. Said to be 100% Tannat although I can’t confirm that. Certainly not as tough as that grape usually is. Smooth, fruity, again very drinkable. About 8€. This is from Huelva, round the Bay of Cadiz from Sanlucar. Not known as a good wine growing area. The grape is zalema, a variety indigenous to Huelva. Nowhere else grows it. Late ripening, vigorous, Doesn’t mind drought, likes poor soils. The wine is light, neutral , slight almond flavour. Needed to be drunk very cold. Only 11%. Rather disappointing as ambitiously priced at about 10€. The back label of Campo Aldea 2008 decribes the wine as ‘exciting and rare’. This Riojan red wine is made exclusively from the Graciano grape, a variety which is more likely to form part of a blend. 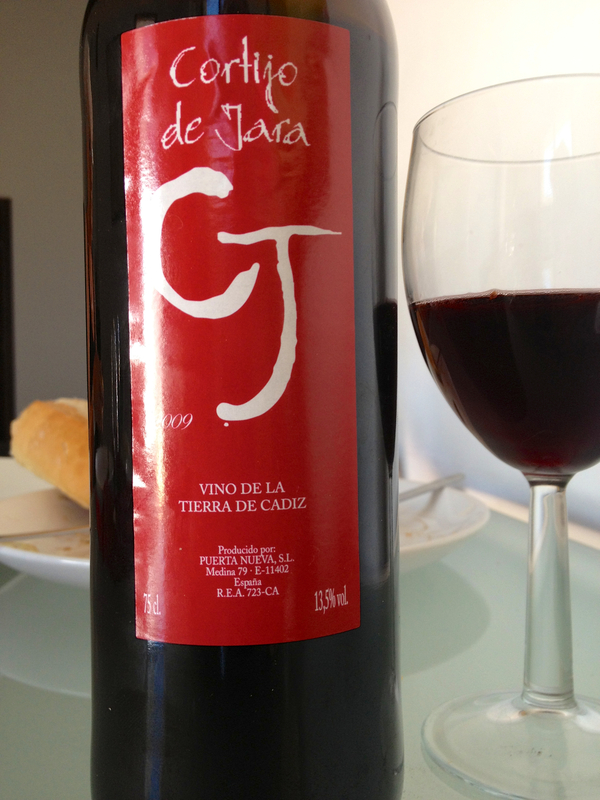 Richard has posted positively about this grape before as, in Jerez, it’s called the Tintilla de Rota. M & S sell this at £12.99 and I would say that it’s good value at that price. The colour is a uniform deep red, with no purple or brick edges and, surprisingly given its 14% ABV, with little evidence of viscosity. The nose is fragrant rather than powerful, hinting, as it does, of freshness and acidity. There was some evidence of the two years barrel ageing, but it was not over-powering. The palate showed refreshing acidity, balanced by the savoury qualities, but was gently rich and smooth with a sweet red-fruit tang. It had good length. 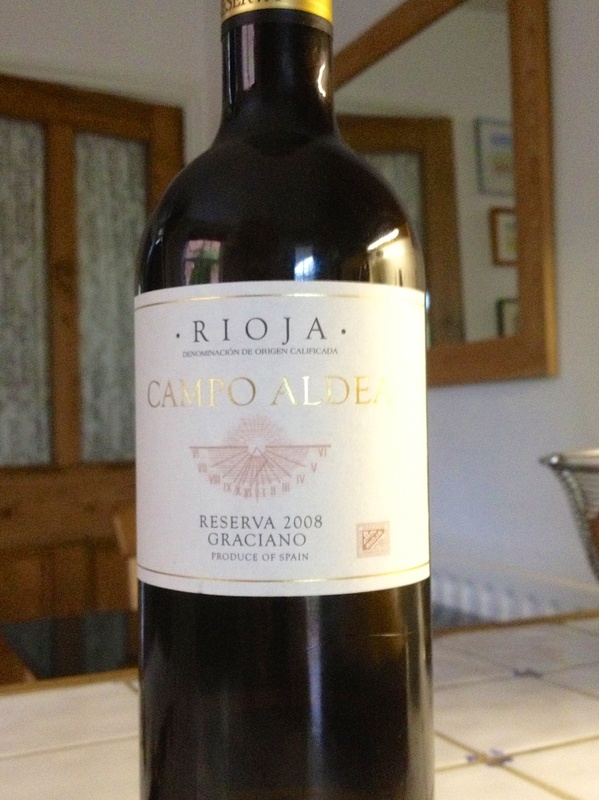 It was interesting to recognise what it brought to the Rioja blend – i.e. style rather than power – and this is reflected in the advice on the label ‘drink within 2 years of purchase’. I have to disagree with the food pairings recommended on the bottle – ‘roast leg of lamb, beef stew’ – which I think could eclipse the delicate flavours. It’s acidity might match some tomato-based sauces. It’s a well-made wine, good value, as well as being interesting. Well done M & S.